ELIZABETH FEHRINGER/ gtphoto@greeleytribune.comOverall grand champion winner Tate DePorter, 10, of Eaton kneels behind his hog. From left: Tate's sister, Alyssa DePorter, 12, friend, Bo Naibauer, 12, and dad, Travis DePorter squats in front of Bob. Bob was named grand champion of the heavyweight Hampshire division at the Weld County Fair on Saturday at Island Grove Regional Park in Greeley. It’s been a really good fair for the sister and brother team of Alyssa and Tate DePorter of Eaton. First, Alyssa, 12, won the grand championship market goat show, then little brother Tate, 10, took grand championship honors Saturday afternoon in the market swine show, duplicating the efforts of his older sister last year. 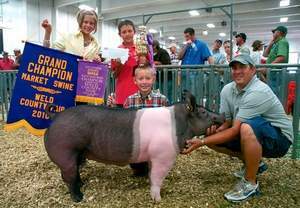 “Oh my gosh, Oh my gosh,” Tate gushed after he got out of the show ring where Brian Arnold of LaFayette, Ind., had called “Bob” a “hog that was just tremendously powerful,” in naming him the grand champion. Reserve grand champion went to Taylor Dorsey, 13, of Eaton, with a 282-pound crossbred barrow she called “Snickers” that had won the heavyweight crossbred division. Tate’s 272-pound Hampshire had taken the heavyweight division of that breed earlier in the day. In all, Arnold went through about 275 pigs from 8 a.m.-6 p.m., with about a 35-minute break for lunch. “I’ve never seen him this happy. Usually, he’s pretty laid back and quiet,” Travis DePorter said of his son as he watched him bounce around the warm up pen when big sister Alyssa wasn’t grabbing and squeezing him. “No, I really didn’t think I did, but I guess I did,” Tate said when asked if he thought he had a chance of winning the top title coming into the show. The pig was bought earlier this year from a breeder in Texas. He is a member of the Wyatt 4-H Club. Taylor, a member of the Country Boots and Skirts 4-H Club, admitted that while Snickers “sounded like a girlie name to a lot of my friends,” she said, “but I just can’t see him anything but Snickers.” She bought the pig this spring from Jason Simpson of Ault with the intent of bringing the pig to Greeley for the fair. She is the daughter of Dustin and Kim Dorsey of Eaton. The two champions will lead the swine division into the sale ring at the conclusion of this year’s fair with the Junior Market Livestock Sale, which starts at 3 p.m., Monday. Today will be family day at the fair, which will include the All Around Livestock Showmanship Contest and several other activities at Island Grove Regional Park including the fair barbecue. It was Arnold’s first trip to Greeley to judge the Weld fair, but he said he looked forward to the opportunity. He is an agriculture business instructor and livestock judging coach at Black Hawk East College in Kaween, Ill.
“I was just absolutely thrilled to come out here to Weld County. I enjoy working with some great youth and breeders at college, but any time you can come to Weld County you know you are in for a treat. This county has a great reputation all over the country,” Arnold told the large crowd at Saturday’s show.